This past Saturday both KSU and MU played, although not each other...that game will be Saturday, November 13th and it should be an exciting day at the Ludlow household. I expect to be dressed up as a purple backing Wildcat but I haven't told dad that yet, so lets keep that one in the bag. Dad had some of the guys over to watch in the newly finished basement. He mentioned playing poker afterwards so mom thought it would be best to head out to BobBob and Ta's house (the literal part) to spend the night and get some rest (sometimes the guys get rowdy). Dad spent the evening rooting for MU with their one cheer (MIZ-ZOU for those of you who don't know it) and mom spent the night cheering on the Wildcats (the figurative part of the house divided comment in case you didn't get it). As you can see from the stats below, both KSU and MU managed to win. After this year (on July 1, 2011 to be exact), Nebraska will no longer be a part of the Big 12. Good riddence (just kidding Kristin and Phil). 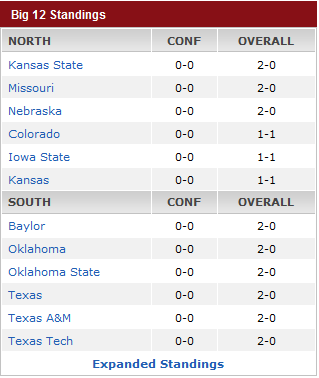 The Big 12 will be down to 11 teams, but they'll still call it the Big 12? So how does that make any sense. I digress. I slumber partied with mom and cousin Pierce out at the grandparents house. We had a good time except I didn't sleep the greatest. You know how it is when you're not in your own bed and you can't get comfy and you wake up every 2 or 3 hours. The next day I was still frazzled by my lackluster night of sleep and stayed up the whole day. I even stayed awake during church on Sunday morn if you can believe it. All that waking time must have worn me out because mom put me down at 10:30pm and I didn't wake until 5:30am on Monday morning when mom woke me (she was paranoid I had a case of the SIDs). I was too tired to even soil my diaper and slept the ENTIRE SEVEN HOURS! Not much else worthy of mentioning other than I'm getting plenty of play time on my activity mat and have started being all grabby grabby with my toys. I'm not the most coordinated, but am definitely working on it.